The original small heritage home consisted of three bedrooms, a small living, kitchen, laundry, bathroom and a wonderful large north facing backyard. 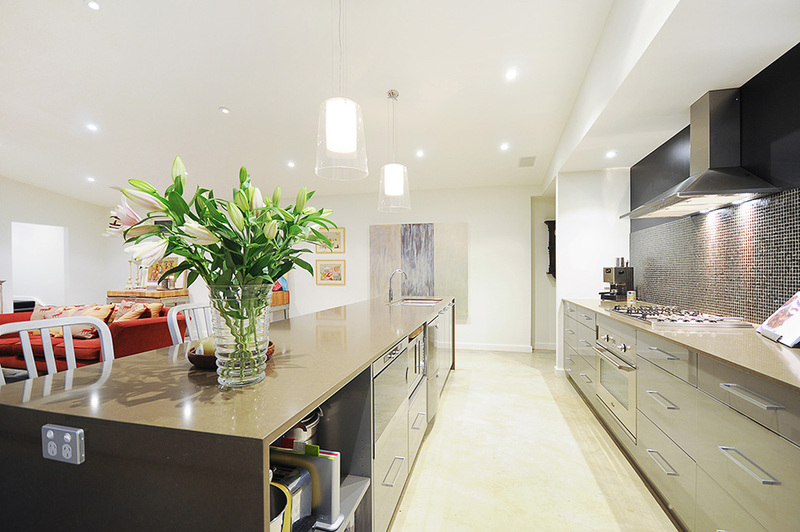 The project remodelled the original kitchen into a study and the new large extension incorporated a galley kitchen, an open plan living space bursting with warmth and light, a paved alfresco area together with a large master suite and ensuite. The extension boasts a fabulous floor plan creating an amazing sense of space flowing seamlessly from the old to the new. Whilst the façade of the heritage cottage remained the same, the home extension design was contemporary and striking. The highlight of this north facing extension is the superb solar passive design. The solid ash double glazed windows and doors create walls of glass that is the ultimate in indoor / outdoor living. In fact the aspect, design and build are so good that the clients did not use the in-slab hydronic heating during the end of winter. The features of this impressive space include polished concrete flooring throughout the living area and kitchen, high raked ceilings that meet hi-lite windows and solid ash double glazed windows and doors throughout. The kitchen features caesarstone bench tops, timber veneer panelling, custom built joinery, European stainless steel appliances, an undermount sink,a mosaic tiled splashback, a recessed pantry disguised as wall art and glass pendant lighting. The segregated master bedroom offers a vast amount of custom built joinery and private outdoor access. The ensuite is a private sanctuary featuring a free standing bath, custom built joinery, mosaic tiled bench top and pendant light. The exterior is as impressive as the stylish interior with the greatest feature being the 1200mm wide raked eaves cladded with eco-ply and finished with an acrylic stain. The roof and the eaves are united by an inspiring steel angle element and an array of downlights highlight the bold statement. The external walls are completed with a render and paint finish and the large paved alfresco area unites the outdoor with the indoor living space.